The Help Generator provides help authoring tools to create chm help files, browser based help and printed user documentation. The modern, Office style, help editing environment has many features to make you highly productive and guarantee quality output. Edit using WYSIWYG (HTML) Help Editor with the modern Windows fluent ribbon. Use the Help Generator help authoring software to create the standard windows help files, also called chm files or compiled html help file, and browser based help for any windows application. 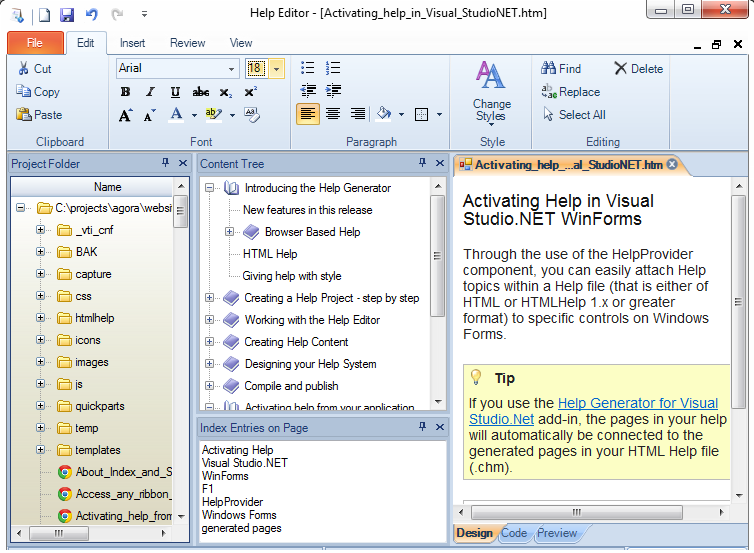 The Help Generator add-in makes for each form in your application a descriptive topic page which include a title, screenshot with image map and sections for all controls. The pages generated by the add-in are been automatically integrated with your application so that you have instant F1 support for context sensitive help. Add-in versions are available for Visual Studio .NET, Visual Basic 6 and Microsoft Access. Includes the Help Capture tool to generate complete topic pages from any part of your applications user interface - forms, menus, ... - again, a great time-saver! Control over the many HTML Help settings unleashes the power of the Help Viewer with features like the Favorites navigation tab and extra button on the toolbar. To create chm file you need to have the free HTML Help Workshop installed. The web help is implemented using jQuery. Consequently it will work on virtually all browsers. Use Topic templates and Quick Parts as boilerplates for styled pages and page sections. Topic content is in HTML - or XHTML - giving you full control over your content pages. Drag and Drop support with many uses to increase your help authoring productivity. Includes tools to find and fix broken links in pages, table of contents and index before publishing. Supports Unicode and help in all languages. Uses OpenOffice spelling libraries - available for free. The user documentation is generated in Word. In Word you can save this to PDF. Genuine single source publishing: create texts once, publish to different formats and media. Works with Windows XP, VISTA, Windows 7, Windows 8 and Windows 10.